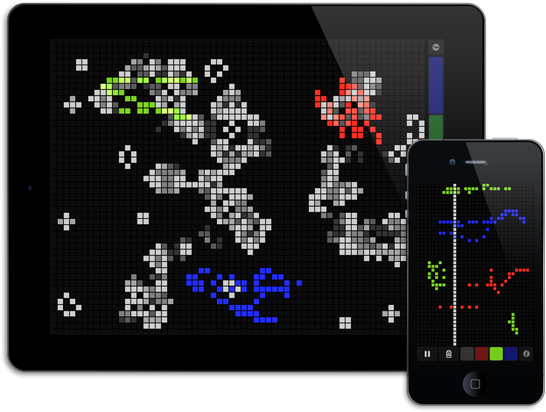 The SoncLife application runs a simple cellular automaton on a grid of cells. And that means? Send control signals to your DAW or synth based on the laws of evolution. The cells can be interacted with by touch and triggers of three different colors can be placed on the grid. The automaton can be set to five different rule-sets, from classic Game of Life to simple horizontal or vertical stepping. Triggers are fired by “alive” cells and send their state as OSC messages to a configurable host on the same Wi-Fi network. Cells and triggers can be randomized by shaking the device. To start using SonicLife you have to configure a computer to receive the OSC messages sent by the application. In the Host field enter the hostname or IP address of your computer, these values can usually be found in the “Network Settings” or a similar control panel. In the Port field enter the port number the software on the receiving computer is set to listen for messages on. To test if your setup is working correctly you can download and install a version of Pure Data Extended for free. Open of the example PureData patchers from the list to the right and set the Port field in SonicLife to 8000. Support and updates for SonicLife have ceased, however if you run into problems, please contact us.